The Dudley Farm String Band plays the Best Video Performance Space on Thursday, Mar. 28. 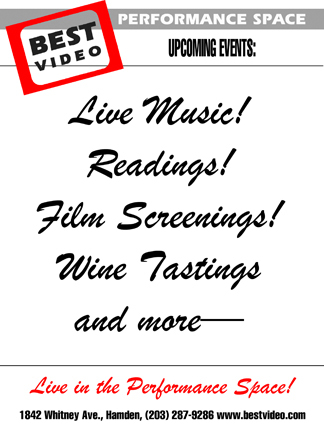 The music starts at 8 PM and the cover is a sliding scale of $5-10 (pay what you can in that range). While they have roots in bluegrass, Dudley Farm String Band brings together bluegrass, traditional and progressive styles. You might hear them playing old-timey standards one minute, and progressive folk or rock-‘n-roll sets the next. They have a great time when they play together, and it shows. They pull tunes and styles from the likes of Bill Monroe, Ralph Stanley, The Soggy Bottom Boys (from “O Brother Where Art Thou?”), Doc Watson, Bela Fleck, Pink Floyd, Irving Berlin, Jerry Garcia and David Grisman. The group has also developed a substantial collection of original tunes. 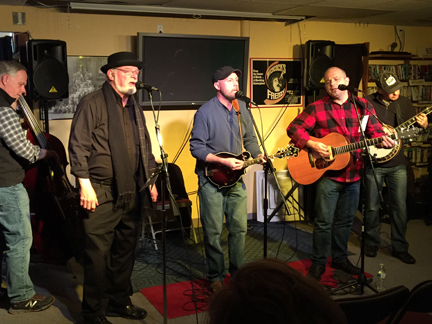 The five band members play a range of folk instruments: Mat Crowley – mandolin; Irv Hagwood – banjo; Stan Hershonic (who is unavailable for this show, unfortunately) – resonator slide guitar, mandolin, banjolin and harmonica; Mike Sinclair – bass and harmonica; and Brian Young – guitar, banjo and bass. They all sing from time to time, with Brian, Mat and Stan most often featured. They’ve played in venues around the state, including: The Podunk Bluegrass Festival, East Hartford, CT; Yale University Art Gallery, New Haven; Medad Stone Tavern Museum, Guilford; Madison Historical Society and Bauer Park, Madison, CT; Night of a Thousand Stars (Guilford Free Library); North Branford Library; The International Festival of Arts & Ideas, New Haven, CT; The Durham Fair, and, of course, performances at Dudley Farm. Dudley Farm String Band also recorded traditional music for the soundtrack of a Dudley Farm video showing a recent barn-raising at the farm.